Coppell fought its way to victory against the Lady Jaguars in Friday’s volleyball match, winning three of the five sets they played, 25-22, 22-25, 28-30, 25-18 and 15-12. 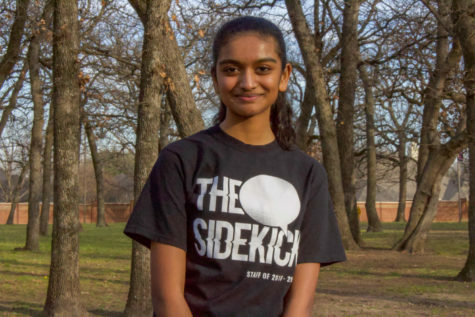 The Cowgirls are now the only undefeated team in the district. The first game began with a series of good offensive and defensive plays from both sides. While Flower Mound took the early lead, the Cowgirls pulled ahead and never looked back. Senior setter Stella Yan made several successful assists and made digs throughout the entirety of the match. Combined with the offensive power of senior outside hitter Amarachi Osuji and the defensive power of senior libero Maci Watrous, the team found its way to victory. Yan ended the first game, the Cowgirls coming away with the score 25-22. The second game proved to be a good fight between the two opposing teams. It was a back and forth battle, with Coppell and Flower Mound taking turns being ahead, behind, and tied. In the end, the Lady Jaguars came up with the win, 25-22. The third game began as a close match and never changed. For the majority of the game, the teams were always within three points of each other. While the Cowgirls put up a good effort, with more incredible digs by Yan and Watrous, as well as strong spikes and blocks from sophomore middle hitter Madison Gilliland, it was not enough to stop the offensive force of Flower Mound. Coppell fell 28-30. The fourth game began with a strong Coppell force, going so far as a 5-0 lead. That lead was never lost the entirety of the set, as the Cowgirls found a strong rhythm of play. From deep digs that saved the ball multiple times to powerful spikes sent at such high speeds that they ricocheted off of opposing players, the team was in good shape and ended the game 25-18. This was the largest margin of points in any of the games. The final game was a nail biter to the end, with both teams displaying an array of strength in various plays. Both teams had come into the match 4-0, and the reason why could be seen on the court. Coppell managed to take the lead and extend it until the winning spike by senior outside hitter Pierce Woodall. The Cowgirls took the game, 15-12, seizing the match 3-2. This was also a big night for Yan, who made her 1,000th assist during the match after coming in with 987 under her belt. 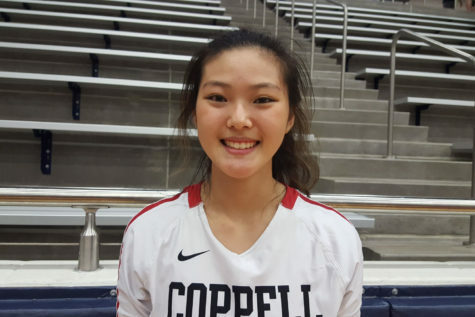 Coppell High School senior setter Stella Yan makes her 1,000th career assist. She was a major contributor to the victory over the Lady Jaguars. Not only is this a motivator for Yan, Friday’s match will be a source of motivation for the entire team. Having defeated one of the more difficult teams in the district, the Cowgirls have grown even more confident in their abilities. From here on, they hope to continue their winning streak and inch ever closer to the district title.